Writers: Michael Bacall, Oren Uziel, Rodney Rothman, based on the television series “21 Jump Street” created by Patrick Hasburgh and Stephen J. Cannell. 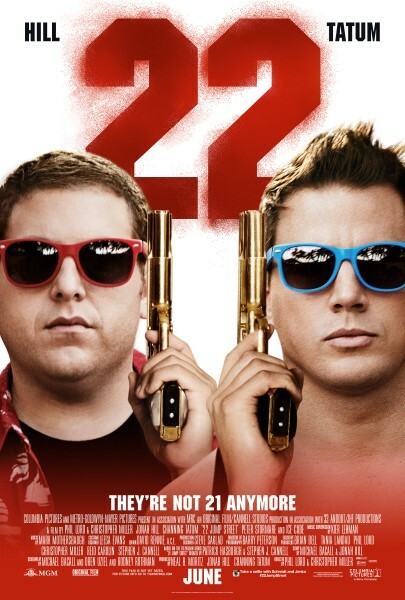 Synopsis: After making their way through high school (twice), big changes are in store for officers Schmidt (Jonah Hill) and Jenko (Channing Tatum) when they go deep undercover at a local college. But when Jenko meets a kindred spirit on the football team, and Schmidt infiltrates the bohemian art major scene, they begin to question their partnership. Now they don’t have to just crack the case – they have to figure out if they can have a mature relationship. If these two overgrown adolescents can grow from freshmen into real men, college might be the best thing that ever happened to them. Review: The box office success of 21 Jump Street all but ensured a sequel would happen, and just two years down the road Phil Lord and Christopher Miller (who seem to be able to do no wrong in their directing career thus far) are back with 22 Jump Street. This is a sequel that nudges and winks constantly at all the stale conventions of sequels, and it relentless lampoons all these conventions, making it one of the most self-aware sequels I have ever seen. Nothing is spared – it understands that almost all sequels are inferior retreads to the originals, turns the “meet cute” scenario on its head, pokes fun at the increasingly ridiculous action setpieces in movies these days, and brings bromance to its most extreme, Brokeback Mountain-esque incarnation. Not everything works, but there definitely are enough moments in 22 Jump Street to justify its existence. Nothing has changed from 21 Jump Street in this sequel, and the premise is identical – the two cops have to infiltrate a learning institution to find the source of a new designer drug. It’s moved from high school to college, and there’s a tacked on spring break segment (easily the weakest link in the movie), but despite the change in address the same positives and negatives that the first movie had is also intact here. The movie is still hit-and-miss when it comes to the comedy (but when it’s funny it’s laugh-out-loud hilarious), the running time is still a bit too long, and the central story really isn’t all that interesting. Yet somehow the movie works, sometimes even better than the first. The chemistry between Channing Tatum and Jonah Hill has become more assured, which is even more important this time round because of the focus on their bromance. Ice Cube continues playing the best “angry black Captain” in recent memory, and manages to steal the limelight every time he appears on screen. It’s probably a good thing that he has limited screentime, or he would have probably stolen the entire show from the main leads. Ice Cube is also key to what’s probably the best scene in the movie – his reaction to a revelation – and it is an absolutely priceless sequence, almost worth the price of entry on its own. While 22 Jump Street is unlikely to forge new fans of the franchise, moviegoers who appreciated the first movie would definitely find things to like about this sequel, uneven as it may be. P.S. The distributor has requested not to discuss an element of the movie, so I can only cryptically mention that there is a rather well executed sequence, but one must be patient in order to see it in its entirety.